Plutonium comes out in the first work as the power of the Delorian converted to the time machine of the movie "Back to the Future". One piece, how did Doku obtain the plutonium, a trailer movie "1.21 Gigawatts" that followed the episode appeared. Television news that it turned out that plutonium was stolen two weeks ago. On this day, Doku fell down in the toilet and bumped his head, got the idea of ​​a dimension transfer device. "Time travel on October 26, 1985"
About 30 years later, Delorian which became time machine was completed. Time travel experiments were held. It looks like boarding procedure. Looking at the screen, the passenger is Emmet Brown, or doc, the departure place is Mehrabad in Iran and the destination is Libya. One way, a doz out from Iran to Libya. I do not know whether it is Iran or Libya, but there are a lot of men armed with the truck bedding, a little noisy atmosphere. A considerably young dog compared to the time traveling. There were 2.5 million dollars (about 280 million yen) of money. A giant cannon ball is rolling over Here, what facility is it here? Of course, there is no way the story goes to peace. To get plutonium, Doc will undertake nuclear bomb manufacture. It is natural that it is marked as a dangerous person. The title comes from the power required to move the dimension transfer device attached to the derolian. However, in writing, the scriptwriter Bob Gale wrongly stated as "jigo watt" is used as it is. Delorian after the 2nd work did not mind paying attention to the electric power supply because Doku installed a device called "Mr. Fusion" when the time traveled in 2015, but in the early days the atom plutonium-fueled I loaded a furnace. As mentioned above, Doku obtained plutonium in exchange for nuclear bomb manufacture, but in reality it handed in an omnibus bomb using pinball parts. It is exactly as drawn in this volume that retaliation by angry extremists was just a test day of the Drollians. Pinball also appears in a glance in this movie. Naturally, this movie is an informal one created by fans. 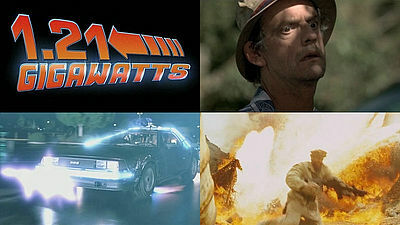 Made by Tyler Hopkins, the material is "Back to the Future", and Christopher Lloyd acting as a dog is appearing "Bravo Mars people 2000"(Published in the United States in 1999 / unpublished in Japan)," During our summer camp / parent's none "(released in 1996 video),"When you die in Denver"Published in 1996,"Brave Dennis"(Published in 1993), and although Lloyd has not appeared,"Zero · Dark · Thirty"Published in 2013,"Argo"Published in 2012,"Total Fears"Published in 2002,"Syriana"Published in 2006,"Ironman"Published in 2008,"Bad tuning"(1994 video release) was used. "What should I do if the pilot faints and amateurs are to fly" Real pilots seriously comment on "Microsoft Flight Simulator"